Daniel Bryant (1803-1858) and Lucy Key (1810-1903), the parents of Adeline Elizabeth Bryant Spence, were born in Franklin County, Virginia. Tracing Daniel Bryant’s family has been a challenge because of the constant change in the spelling of the name. I originally thought he was part of the large Huguenot family of Bryants from Buckingham and Cumberland Counties, Virginia, many of whom eventually settled in Kentucky. But the name was originally “O’Bryan”–later “Bryant”–and Daniel’s ancestors were Scotch-Irish, who intermarried with the O’Brians/O’Briants. Be it Remembered the thirtieth day of March in the year of Our Lord one thousand seven hundred and fifty one I Cornelius O’Bryan of Augusta in the Colony of Virginia yeoman being very sick and weak in body but of perfect mind and memory thanks be given to God therefore calling to mind the mortallity of my body and knowing that it is appointed for all men once to dye do make and ordain this my Last Will and Testament that is to say principally And first of all I give and recommend my soul into the Hands that gave it and for My body I recommend it to the Earth to be Buried in a Christain like and decent manner at the discretion of My Executors and as touching such worldly Estate wherewith it hath pleased God to bless me in this life I give devise and dispose of the same in the following manner and form – Imprimis it is my will and I do Order that in the first place all my juste Debts and Funeral Charges be paid and satisfied – Item I give and bequeath unto Rebecca my Dearly beloved wife one hundred Acres of Land during her natural life or she Continues My widow but after her Death or Mariage the said one hundred acres of Land to go unto my Son John Bryen his heirs And assigns forever likewise the old white horse and brown horse and a roan cow and a brown cow of the heifer that come of her and six sheep her choice of the stock together with all my household good during her Natural life And if she marries or when dys to go unto my son John likewise, — Item I give and bequeath unto my son Cornelius O’Bryen a roan mare, — Item I give and bequeath unto my son Thomas’s Eldest son Benjamin a roan yearling colt which came of the mare that I gave unto Cornelius my son, — Item the Rest of my stock Excepting the swine to be Equally Divided amongst the Remainder of my Children These I give and bequeath unto my son John O’Bryan all the remainder of my Estate Both real and personal unto him his heirs And assigns forever, Item I do constitute and ordain my well beloved wife Rebecca and my son John O’Bryen my only and sole Executors of this My Last Will and Testament and I do hereby utterly disalow revoke and disannul all and every other former Testaments Wills Legacies and Executors by me in any ways before this time Named willed and bequeathed Ratifying and Confirming this and no other to be my Last Will and Testament In witness whereof I have hereunto Set my hand and seal the day and year above written . In his will, Cornelius identifies his wife as Rebecca, and his sons as John, Cornelius Jr., and Thomas. John, who must have been his eldest son, became the executor of his estate along with his mother. He mentions a grandson named Benjamin, who was the eldest son of Thomas. Cornelius signed his will March 30, 1751 and the will was recorded May 28, 1751, indicating that he had died during that period of time. John O’Briant posted his bond as executor November 26, 1751. John Bryant’s name earlier appears on the Augusta County Records where he was appointed as appraiser in another estate on May 10,1749 . Name: Cornelius O’Bryan Date: 10 Jul 1762 Location: Augusta Co., VA Property: 150 acres on Linvel’s Creek, beginning at kern of stones; cor. John O’Bryan; cor. Cornelius O’Bryan, on the side of the Bald Hill, Watering Spring Run Remarks: Grantors are surviving joint tenants of Cornelius, John, and Cornelius O’Bryan, Jr. 20. Part of 500 acres conveyed by Hite & Co. to Cornelius, John and Cornelius, Jr., 24 Jun 1744. Delivered to Thomas O’Bryan, Jul 1766. Description: Grantor Book Date: 10-458 . I believe that one of these sons-Cornelius, Jr., John, or Thomas-had a son named John Bryant who relocated to Pittsylvania County-today, Franklin Co., Virginia-where he married a daughter of Dennis O’Briant. Dennis O’Briant was an early settler on Nicholas Creek in Pittsylvania County, having arrived before 1767 and having acquired his property of 286 acres on July 14, 1769. (Note: In 1776, this land would be situated in Henry County and in 1786, the land would lie in Franklin County, owing to the creation of new counties during that period of time. His wife’s name is unknown. Two of Dennis O’Briant’s children have been identified: a daughter named Ann (1758-1850) who married Daniel Prillaman (1758-1854) and a son named Dennis O’Briant, Jr. (b. 1769; d. before 1802). There are additional O’Briant names in the area, but with no proven connection to Dennis, Sr.
Jacob Prillaman (1778-1858) Dennis Prillaman (1780-1840) John Prillaman (1782-1853) Elizabeth Prillaman (1788-1812) Judith Prillaman (b. 1790) Daniel Prillaman (1799-1844) Susan Prillaman (1794-1899) Ann Prillaman (1799-1892) Ruth Prillaman (1802-1896) . Daniel Prillaman came to Virginia with his father Jacob. On 19 Jan 1778 Daniel Prillaman, together with Dennis O’Briant & John Bryant, “refuseth to take & subscribe the oath or affirmation of allegiance to the Commonwealth of Virginia” (Virginia Magazine of History & Biography, Vol. 9 pg 14). This refusal may have been because of his religious convictions, or because of a stronger allegiance to Germany & England. In the first list of tithes taken in Henry County in 1782, Daniel Prillaman’s name appears, with those of his father & two brothers, & he was listed as a resident of that county until 1786, when he & his family appear in Franklin County, which had been cut off from Henry the preceding year. On 17 June 1783, Daniel had received a grant of 285 acres in Henry County, on Nicholas Creek adjoining Dennis O’Briant (Commonwealth Grants & Patents, Book H, pg 243). Nine years later, on 10 July 1792, he acquired the plantation of his father-in-law, Dennis O’Briant, by a deed of gift, consisting of 286 acres on Nicholas Creek, which was then in Franklin County (Franklin County Deeds, Book 2, pg 414). This land had been granted to Dennis O’Briant in 1769, & later became the property of Daniel’s son, David Prillaman. Daniel Prillaman acquired other land in the Nicholas Creek section in 1802 & 1803. 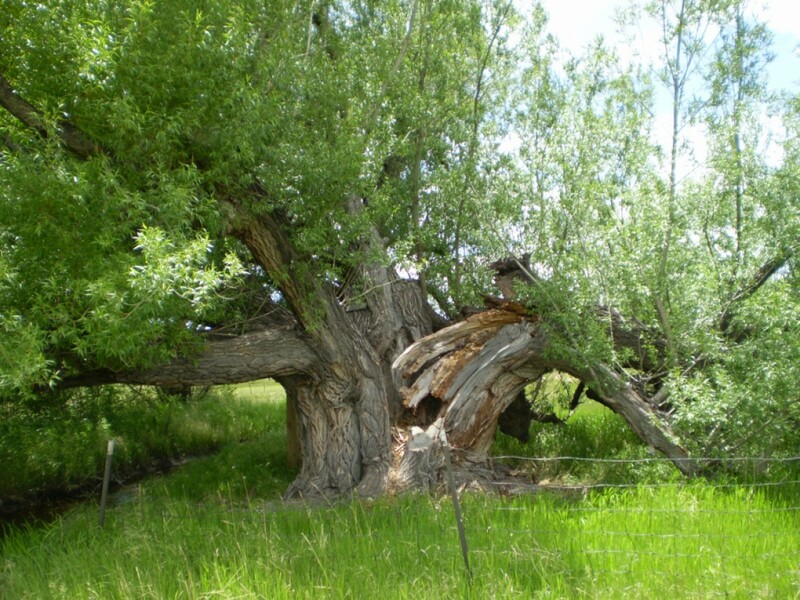 He bought from Robert Stockton, for $43, a tract of 33 acres on 10 Sept 1802, on Nicholas Creek. On 3 Dec 1803, he bought 33 acres from Spencer James & Nathaniel Dixon, which was also on Nicholas Creek. The old home of Daniel Prillaman burned in 1911, at which time the family Bible was also destroyed; the house was rebuilt, using the original chimneys. The family cemetary where Daniel & Ann are buried is on the property. Daniel Prillaman lived in the Brown Hill section, while his brothers remained in Blackwater; possibly Daniel moved because of his marriage to Ann O’Briant, whose father was an early settler on Nicholas Creek. One family tradition relates that Daniel had a powder mill near the original family home, & that one day the mill blew up, & Daniel immediately removed to Brown Hill, leaving his brothers behind. Daniel’s will is dated 1845, probated 1854, & names his wife Ann & ten children . Primitive Baptists are a group of Baptists that have an historical connection to the missionary/anti-missionary controversy that divided Baptists of America in the early part of the 19th century. Those currently denominated Primitive Baptists consist of descendants of churches and ministers that opposed the Baptist Board of Foreign Missions (org. 1814), as well as other innovations such as seminaries and temperance societies. Early leaders include Joshua Lawrence, John Leland, Daniel Parker, and John Taylor. Other names by which Primitive Baptists are known are Predestinarian Baptists, Old School Baptists, Regular Baptists, Particular Baptists and Hardshells. The word “Primitive” is sometimes taken by outsiders to mean “backward”, but in context of this division among Baptists, it means “original”. These churches attempt to retain and/or restore primitive (or original) patterns of church life, such as unsalaried ministers, a cappella singing and feet washing . There was a sharp [difference] between the austerity of the plain-living Baptists and the opulence of the Anglican planters, who controlled local government. Baptist church discipline, mistaken by the gentry for radicalism, served to ameliorate disorder. The struggle for religious toleration erupted and was played out during the American Revolution, as the Baptists worked to disestablish the Anglican church. Beeman (1978) explores the conflict in one Virginia locality, showing that as population became more dense, the county court and the Anglican Church were able to increase their authority. The Baptists protested vigorously; the resulting social disorder resulted chiefly from the ruling gentry’s disregard of public need. The vitality of the religious opposition made the conflict between ‘evangelical’ and ‘gentry’ styles a bitter one. Kroll-Smith (1984) suggests the strength of the evangelical movement’s organization determined its ability to mobilize power outside the conventional authority structure . In addition to the Baptist resistance to continued Anglican control, there was another factor in the Piedmont area of Virginia and North Carolina that may have changed the minds of Dennis O’Briant, John Bryant and Dennis Prillaman. That factor came in the form of a Tory by the name of David Fanning and in other men like him! “During the Revolutionary War, and for several years thereafter, the middle and western counties of North Carolina were infested by lawless bands of Tories and ruffians, who, led by desperate men like David Fanning, pillaged the country, and often slew unprotected persons without mercy. (1917. Ashe, Samuel et al in “Jacob Long,” Biographical History of North Carolina, Vol. VIII, p.287.) . The History of Henry Co., Virginia indicates that during the Revolutionary War, Dennis O’Briant furnished “300 pounds of nett beef” for the Continental Army during the Revolutionary War”. The records are silent about the marriage of John Bryant with [Elizabeth??] O’Briant. However, I have developed a scenario after piecing available records together. Daniel Prillaman married Ann O’Briant in 1777. I believe John Bryant married [Elizabeth??] O’Briant between 1780 and 1785. [Elizabeth??] may have died in childbirth, and I think that she was dead by 1792. On July 10, 1792, Dennis O’Briant, Sr. signed over his plantation to his son-in-law Daniel Prillaman as a deed of gift. John did not remarry until 1802. I could not find any records of surviving children for John and his first wife. Dennis O’Briant, Jr. hadn’t married as yet. And Dennis O’Briant, Sr. appears to have died in early 1793 without a will . Another Bryant appears in Henry County about this period of time: James Bryant, b. before 1765. This James Bryant may have been a younger brother of John Bryant, and decided to join him in Henry County. James Bryant married Sallie Brummett (b. 1768) on July 7, 1788 in Franklin Co., Virginia. She was the daughter of James and Agnes Brummett of Franklin County. The James Bryants moved to Knox Co., Kentucky, where they appear on the tax lists for 1803-1810, as well as on the 1810 Census. They next appear on the 1820 and 1830 Census for Monroe Co., Indiana. The names of their children are not known . A Lewis Bryant also appears in Franklin Co., Virginia Court Records in 1786-1787, both as a jury member and as a participant in some of the actions. He may have been another of John’s brothers and seems to have moved to Bertie Co., North Carolina. According to Bertie, NC Vital Statistics 1700s-1920, Lewis Bryant was born between 1765 and 1784 and he died after 1808 . Dennis O’Briant, Jr., son of Dennis O’Briant, Sr., married Ruth Manier/Maynor in Franklin Co., Virginia September 5, 1792. She was the daughter of Richard Tucker Manier/Maynor and Ann Wright. Richard Manier posted the surety bond . Some records at Ancestry.com indicate that Ruth was born about 1770 in Baltimore, Maryland, and that her family came from there. Dennis and Ruth had two children: Nancy M. O’Briant (m. Levi Martin on February 8, 1808, Franklin Co., Virginia-Daniel Prillaman posted bond)  and Richard O’Briant (1795-1850) . Jacob Bryant, b. May 1, 1821; d. Oct. 30, 1916 . Richard Bryant died in 1850/1853 in Franklin Co., Virginia. Some records indicate that he was a doctor. Dennis O’Briant, Jr. died in late 1801 or in early-to-mid 1802. And on September 6, 1802, John Bryant married Ruth Maynor O’Briant in Franklin Co. Virginia . John and Ruth Maynor Bryant became the parents of Daniel Bryant, father of Adeline Elizabeth Bryant Spence. Daniel Bryant was born in 1803 to John and Ruth Bryant in Franklin Co., Virginia. His brother David Bryant was born in 1812. John and Ruth Bryant appear as the parents of Nancy Maynor O’Briant on the 1808 Franklin County Marriage Record, but Nancy was really the child of Dennis and Ruth Maynor O’Briant, as was Richard. John and Ruth may have had additional children, but apparently they did not survive. The records grow silent after 1812 on John and Ruth Bryant. Apparently they remained in Franklin County, but Daniel Prilliman seems to take on the leadership role in the family. John and Ruth may have died by 1815/1820. I cannot find anything more about John and there is no record of Ruth’s remarriage. If their parents had died, Daniel and David would have moved in with other family members. In all likelihood, they lived with the Prillimans until they were old enough to go out on their own. Then the Key and Spencer families moved to Franklin County-an event that would shape the rest of their lives. Of all these families, the Key family has been the easiest to trace. Lucy Key was born in 1810 to William Wesley Key (1783-abt. 1860) and Susanna Akers (1777-1819) in Franklin Co., Virginia. The Keys originated in Albemarle Co., Virginia. William Wesley Key (who generally used his middle name) married Susanna Akers in Franklin Co. September 3, 1804. His parents were William Key (1751-1808) and Rachel Hansbrough (1760-1807) . On November 17, 1829, Daniel Bryant married Lucy Key in Franklin Co., Virginia. The surety’s name was John Spencer . Two years previously, John Spencer married Rachael Key on November 20, 1827 in Franklin Co., Virginia. The surety was Wesley Key(s) . Then on October 27, 1834, David Bryant married Rachael Spencer in Franklin Co., Virginia. The surety was Wesley Key . Daniel and David Bryant were brothers. Lucy and Rachael Key were sisters. Wesley Key was their father. Rachael Spencer was John Spencer’s daughter from his first marriage. John Spencer’s father was Sharp Spencer (1770-1834). John (b. ca. 1788) was the half-brother of William Spencer (1817-1888)-who would later relocate with the Bryants to Jasper Co., Missouri and who was one of the defendants in the 1880 grand jury investigation in the John Bass Jones murder case! The Bryants remained in Franklin County. Daniel and Lucy’s son, John A. Bryant, was born 1830 in Franklin County . I do not have an exact day or month for him. Daniel and Lucy did not keep written records since they could not read or write, as indicated on later census records. The family may have moved to Cumberland Co., Virginia as Adeline Elizabeth Bryant was born there May 27, 1833 . Daniel Bryant-Clinton, Putnam—1 m 10-14; 1 m 30-39; 1 m 50-59; 1 f 10-14; 1 f 20-29; Total: 5 David Bryant—-Clinton, Putnam-1 m -5; 1 m 15-19; 1 f 20-29; Total: 3 William Spencer-Clinton, Putnam-1 m -5; 1 m 15-19; 1 f -5; 1 f 20-29; Total: 5 . I don’t know what happened to John Spencer and Rachel Key. They may have moved to Kentucky, or they may have relocated to Ohio. A number of Key family members settled near Dayton. Lucy’s father, William Wesley Key, a widower by 1830 since his wife died in 1819, lived with the Daniel Bryant family in Putnam County. On the 1900 census record for the Lazarus Spence family in Newton Co., Missouri, Lucy Key Bryant indicated that she had given birth to three children and by 1900, only one of those children survived . Daniel Bryant, age 47, farmer, b. Virginia (unable to read or write) Lucy Bryant, age 40, b. Virginia (unable to read or write) John A. Bryant, age 20, b. Virginia Wesley Key, age 73, b. Virginia (listed as “insane.”) Lazarus Spence, age 24, b. Tennessee Adeline Spence, age 17, b. Virginia. William Spencer, age 28, b. Kentucky (unable to read or write) Jane Spencer, age 32, b. Kentucky (unable to read or write) James H. Spencer, age 14, b. Indiana Mary C. Spencer, age 12, b. Indiana Dorcas Spencer, age 10, b. Indiana John A. or H. Spencer, age 9, b. Indiana Minerva J. Spencer, age 6, b. Missouri William D. Spencer, age 4, b. Missouri Milly E. Spencer, age 1, b. Missouri . Sarah B. Bryant, age 18, b. Indiana . His second wife, Mary Amelia Denniston, was born in 1844. They had a daughter named Mable A. Bryant, who was born in 1875 . Like the Lazarus Spence family, the John A. Bryant, David Bryant, and William Spencer families fled Missouri during the Civil War and relocated to Kansas. William Spencer appears on the Tax records for 1865 in Mound City, Kansas . John A. Bryant appears on the Tax records for Fort Scott, Bourbon Co., Kansas. I imagine Lucy Key Bryant went to Kansas with the John A. Bryant family since Lazarus and Adeline had to “get out of Dodge fast!” John Bryant did not return to Missouri, but remained at Fort Scott, Kansas. He appears on the tax records in Fort Scott for 1865, and he is also on the Census records for 1870 and 1880 . He died in Fort Scott, Bourbon Co., Kansas about 1887 or 1888. I don’t have the exact date of his death. David Bryant also left Missouri for Kansas and did not return there. He appears on the 1865 Tax Records for Palmyra Tp., Douglas Co., Kansas with the Samuel and Sarah Spence family of Jasper County. (Samuel was a son of Daniel Spence and Mary Polly Pewitt.) Samuel’s brother, Joel and wife Martha are also residing there . (The Spences returned to Jasper County after the war.) David Bryant last appears on the 1870 Census for Palmyra Tp., Douglas Co., Kansas with his wife Rachel . I have no date of death for him, but he would have died before 1880. James Harvey Spencer–b. Aug. 9, 1832, Putnam Co., Indiana; d. 1921, Jasper Co., Missouri; buried in Moss Springs; m. (1) Elizabeth Casebolt, Sept. 9, 1858, Jasper Co., Missouri; (2) Elizabeth Jones, Jasper Co., Missouri. Mary Catherine Spencer-b. abt. 1838, Putnam Co., Indiana; d. July 2, 1912. No additional information. Dorcus Spencer-b. July 9, 1839, Putnam Co., Indiana; d. March 29, 1918, Sarcoxie, Jasper, Mo (senility); buried in the Dudman Cemetery March 30, 1918; m. Alonzo Decalvis Deming Feb. 25, 1865. John M. Spencer-b. 1841, probably Indiana. No additional information. Minerva J. Spencer-b. March 31, 1844, Jasper Co., Missouri; m. Henry C. Shively, Jan. 1, 1874. William D. Spencer-b. 1846, Jasper Co., Missouri; d. aft. 1870, Jasper Co., Missouri. No additional information. Clemantine Spencer-b. 1851, Jasper Co., Missouri. No additional information. During the rebellion, when General Marshall was taken prisoner, his saddle was purchased for $10 by Lazarus Spence of Union Tp, who has kept it in a good state of preservation, except natural wear and tear. Tuesday, the saddle was purchased by our townsman, James Rainwater, who fully boxed it and sent it to John S. Marshall, present Governor of Missouri. He will doubtless prize the same as a relic of the late war . Susan Key, age 50, b. Indiana . William Key was a younger brother of Lucy Key Bryant and Susan Key was his wife. The two orphaned children who were taken in by the Spences were Mary and Martha Vermillion. Jesse Vermillion, their brother, lived with the Hagerty family in Kansas but by 1870, he moved in with the Spences, no doubt to learn the trade of a blacksmith from Lazarus Spence. They were the children of Hiram F. Vermillion (1820-1860) and Octavia B. Boren (1835-1860) . The son of William Vermillion (b. 1809), Hiram F. Vermillion was born in Tennessee in 1820. He married Octavia B. Boren in Franklin Co., Arkansas on August 1, 1850 . The Vermillions appear on the 1850 Census for Mulberry Tp., Franklin Co., Arkansas . Jesse John Vermillion, Sr., b. 1853, Arkansas. Martha J. Vermillion, b. 1860, Missouri . The name of Hiram Vermillion’s mother is not known, but he had a number of sisters and brothers: H. W. Vermillion, b. 1825; Rachael Vermillion, b. 1826; Martha Jane Vermillion, b. 1828; Edward R. B. Vermillion, b. 1832 . Rachael Vermillion married Jonathan Sherman Scripps Hagerty (b. 1824, Old Miller Arkansas) on January 16, 1851 in Franklin Co., Arkansas. By 1860s, the Swaggertys had moved to Mound City, Linn Co., Kansas, where they remained . Rachel died in January 7, 1885, and Jonathan married Sarah Elizabeth Marrs October 25, 1888 in Blue Mound, Linn Co., Kansas. Jonathan died October 18, 1899 in Blue Mound, Kansas . By the late 1850s, a number of families began moving from Arkansas to Kansas, and the route took them to Jasper Co., Missouri. Pioneers often left part of their families in Jasper County while they went on to prepare a place for them to live in Kansas. Such was the case of Hiram W. Vermillion. A number of Hiram’s family members had already relocated to Kansas and had settled in Bourbon County near Fort Scott. Hiram’s brother William appears on the Kansas Election List for the 6th District of Kansas in 1854 . In 1855, William Vermillion appears on the Territorial Census Records for the 6th District . In all likelihood, Hiram moved his family to Jasper County about 1854 or 1855, and then went to Kansas to join his brother. He returned to Jasper County periodically to see his family. A fever struck Bourbon County in 1860. It may have been typhoid, cholera, or dysentery, but it claimed the lives of a number of people living in the area. Lydia J. Vermillion, age 37, a housewife, probably the housewife of William Vermillion, died of the fever there in March of that year . Mary Elizabeth Vermillion Spence was born March 3, 1858 in Jasper County, Missouri. On June 4, 1877, she married John Adam Shafer (1852-1926) in Newton County, Missouri. Their children were: (a) Charles Edmund Shafer (1877-1926); (b) Fred Austin Shafer (1881-1929); (c) John Lionel Shafer (1885-1953); (d) Earl Silas Shafer (1888-1940); (e) Harry Elbert Shafer (1890-1956). Mary died December 25, 1926 in Joplin, Jasper County, Missouri. She is buried in the Forest Park Cemetery. Martha Jane Vermillion Spence was born October 1, 1860 in Jasper County, Missouri. On April 23, 1876, she married William Hastings Defries (1855-1938) in Newton County, Missouri. Their children were: (a) Magdalene Defries (b. 1877); (b) William Lazarus Defries (1879-1937); (c) Annie Adeline “Addie” Defries (1882-1968); (d) Jesse James Defries (1885-1960); (e) Ernest Todd Defries (1889-1967); (f) Crystal Audrey Defries (1900-1985). Martha died in 1915 in Oklahoma and is buried in Bixby. Jesse John Vermillion lived with the Swagertys in Kansas and then with Lazarus and Adeline Spence in Missouri. He was born in Arkansas in 1853. His wife was Percilla “Ella” C. Clary (1858-1900). Their children were: (a) Mary Ellen “Ella” Vermillion (1880-1975); (b) Jesse John Vermillion, Jr. (1885-1963). Jesse died before 1900 in Kansas. James Boren Vermillion also lived with the Swagertys in Kansas. He was born in Arkansas in 1855, although his death record says 1857. He never married. James died July 3, 1930 in Sacramento, California. 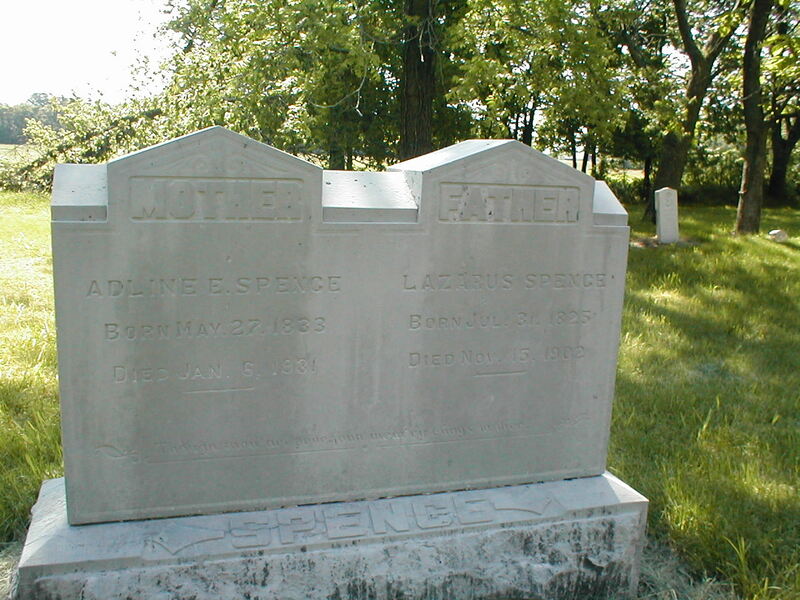 Lazarus Spence died November 15, 1902 in Jasper County, Missouri. He is buried in the Moss Springs Cemetery. Adeline Elizabeth Bryant Spence lived to the age of 98 and died January 6, 1931 in Jasper County, Missouri. She is buried beside her husband in the Moss Springs Cemetery, Jasper County, Missouri. Cornelius O’Bryan Will, Augusta Co., VA Will Book 1, Page 330. “A Relic Returned”, The Carthage Press, July 14, 1887. Available on microfilm: Jasper County Public Library, Carthage, Missouri.